My Youtube channel and blog are titled “Hot Chocolate Hits”. I’ve gotten this question several times- why “Hot Chocolate Hits”? Well, you could go all english class on me and connotate each word. Or you could read it first hand. Sorry to disappoint you- but there’s no particular significance behind the title. I just really like chocolate and I liked the way “Hot Chocolate Hits” sounded. I started the blog in the 8th grade, so I guess I just wasn’t all that deep. But since the channel is “Hot Chocolate Hits”, you’d probably expect a recipe for hot chocolate- or something of that sort. I don’t have a hot chocolate recipe up on the blog or the channel yet, so I figured it was about time to do one. Sort of. This recipe is more of a play on words- it’s more of a chili-hocolate cupcake. A while ago, Lindt released a chili-chocolate bar among other flavors (like chocolate-wasabi) and it was unorthodox. Personally, the concept of balsamic and strawberries seemed a bit strange to me initially- but it works. Just like chili and chocolate. Of course, you’d want to eat chocolate for it’s smooth, rich texture- not for a loud, fiery flavor- that usually comes with chili. That’s why Lindt’s chocolate-chili bar is perfect because it doesn’t have like, a super strong chili flavor. I know I’m Indian but I just don’t take to chili well- I like a subtle kick. That’s why I used cayenne pepper, it’s quite mild in comparison to an Indian chili powder, and I don’t add too much of it- meaning the chocolate flavor in the cupcake is not compromised at all. There is a lingering aftertaste that the chili adds, giving the cupcake that slightly spicy flavor. Not enough to make you drink four glasses of water. I added a little bit of cinnamon, it adjusts the flavor very slightly and you could totally leave it out. But another famous paring is cinnamon and chili- this is popular combination in Mexican hot chocolate- so I thought, “why not”? The cupcake recipe I’m using comes from a popular cookbook- Joy of Cooking. I wanted to give you the perfect chocolate cupcakes, so I tested four different recipes that I love. This one was the best. It was very light, very chocolatey, not too rich and definitely moist. It’s not like a ‘death by chocolate’ cupcake, but It’s probably my go-to chocolate cupcake recipe now. And the frosting. The best part. It’s very, very creamy and sweet, perfectly balancing the amalgam of flavors in the cupcake. Finally, the finishing. I love to garnish these cupcakes with chili flakes so that people know what they’re in for. 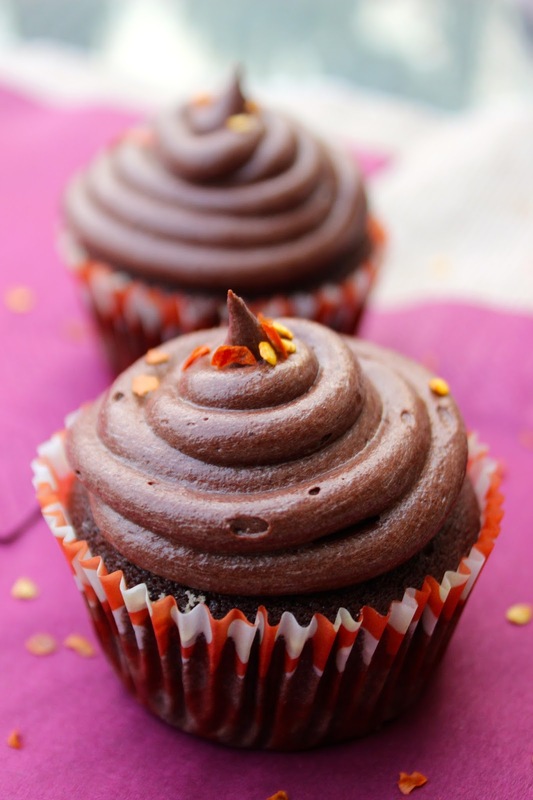 You are going to love this slightly bitter, slightly spicy “hot” chocolate cupcake recipe. For the frosting:*NOTE* this recipe makes enough for 22-24 cupcakes so you might want to 1/2 it! 1. 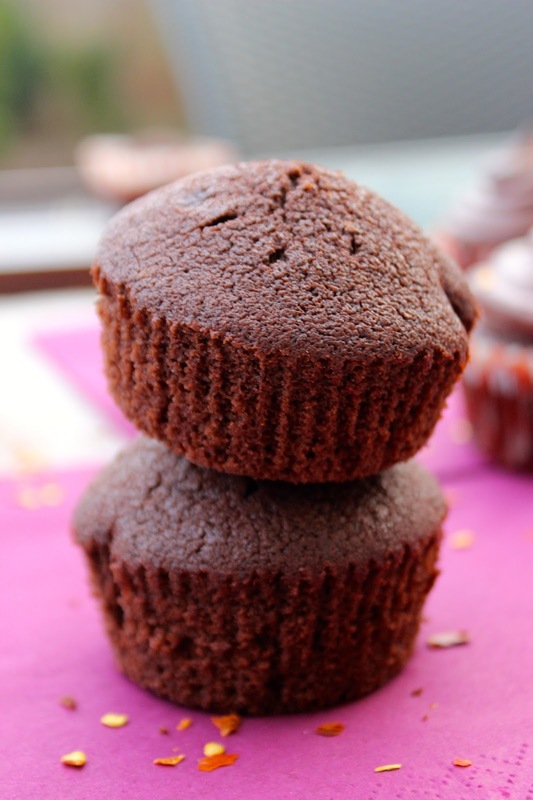 Preheat the oven to 375 F or 180 C and prepare your muffin trays for 14 regular sized cupcakes- line with paper liners. 2. In a small bowl, combine the water and cocoa, mixing until smooth. 3. In a medium sized bowl, whisk together the flour, baking powder, salt, cayenne, and cinnamon and set aside. 4. In another bowl, cream together the butter and sugar until light and fluffy. 5. Add the eggs, one at a time and the vanilla extract. 6. Gradually whisk in the flour mixture until just combined. 7. Gently stir in the cocoa mixture. Careful not to over mix the batter as this will work the gluten and you’ll end up with a tougher cupcake. 8. Spoon the batter into the paper liners around 3/4 of the way full. Use an ice cream scoop if you have one. 9. Bake for 16-18 minutes or until a toothpick comes out clean. Make sure you don’t over bake as this will result in a drier cupcake. 11. For the frosting, whisk the cocoa into the melted butter. 12. Add in the cayenne pepper. 13. Gradually add in the powdered sugar alternating with the milk. 14. Add the vanilla and continue beating for 2-3 minutes or until light and fluffy. 15. Spread the mixture over the cupcakes (or pipe) and garnish with the chili flakes. I get why you’d ask that- since the butter we use is melted- however, the frosting tends to melt if you pipe/smear it on a warm cupcake and then it doesn’t hold its shape and becomes a sticky mess.